We get quite a few queries about the new SANS 10400-X and SANS 10400-XA on our website. I have read through the regulations, but need clarification on whether an application is required when changing existing steel framed windows into aluminium framed windows (not altering the openings). Specifically- do we need to comply with Part XA? I am doing internal alterations to an existing building. It is currently being used as a Student Residence and the buyer wants to turn it into bachelor units. Do I need to take part XA into account even though it’s just an internal alteration? Will I need to brick up existing windows to meet with the fenestration requirements so forth? I am in the process of submitting plans to the Municipality and requested exemption from the new regulations SANS 10400XA because I developed my plans before the introduction of the new regulations. What are the chances of getting the exemption from the municipality? What would be the consequences if I want to sell 10 yrs later? Q: I have completed building a house with plans approved in Sep 2011,I am waiting for the certificate of occupation from the local authorities. I have added a balcony on the new development. Should the whole plan be re-drawn or should my architect draw up the added part only? What is the impact of the new energy regulations? What I meant was the SANS energy & fenestration calculations, I was wondering if a simple plan for a double garage would require the calculations submitted as it isnt a dwelling space. We are including a Guide on How to Comply with the New SANS 10400-XA Regulations. This has been put together by SAIAT (The South African Institute of Architectural Technologies – Die Suid-Afrikaanse Instituut van Argitekstegnoloë) as a helpful guide to help the public comply with the new SANS 10400-XA . The amendments to RegulationXA that were gazetted on the 11 November 2011. Which class of building must comply? Regulation A20 lists all the building classes and the occupancy (what the building is used for) that are allowed. One of the main things covered, and of concern to most homeowners, is the question of how this affects existing buildings and intended additions, alterations and extensions to already existing buildings. It explains how a building must be sited in relation to true North and uses SANS 204 as a guideline. The sizes of windows in North, south, East and West walls and if the calculation cannot be satisfied then how to change the type of glazing that must be used. An explanation of what is meant by the word “summer” and the ø angle. And the application of the P,G & H distances. P = Horizontal distance from the edge of the overhang to the glass surface. H = Vertical measurement from the overhang to the bottom of the glass. G = The measurement from the top of the glass/lintol to the underside of the overhang. Ø = The angle of the sun during summer. With a table of South African towns with the summer sun angle. How to apply the 15% per floor fenestration rule. Insulation of masonry and non-masonry walls and how to calculate the total R-Value. How to comply with the minimum R-Value and gives tables of K-Values for most materials. 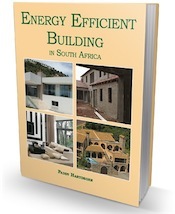 Mainly the use of energy by lighting in buildings. And the compliance rule that at least 50% of the annual average of electricity used for water heating must be heated by other means. All these calculations must be done by a “Competent Person” and they must use software applications that have been approved by Agrément South Africa. We hope you find this article helpful. We would appreciate any comments that you might have below. We are unable to provide that kind of detail Marcelle because sites are different and if this is a complex, there may be additional rules. If it is a complex, check with the body corporate. In any case ask the municipality for guidelines.